I am in the countdown, getting butterflies, and starting to have those back to school nightmares about how much the kids will hate me. Yes, school starts in 3 weeks. 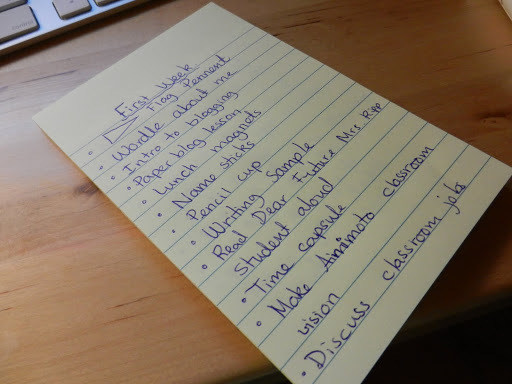 So yesterday I sat down and brainstormed what I would do those first two days or week with my kids. We start weird this year with orientation on Thursday and then full day Friday but then Labor Day weekend so I don’t plan out the lessons. But I do make a list of all the things we should do. Care to see it? Wordle about me – I have parents hand in 5 secret adjectives to describe their child and then we add 5 of our own and it make a really great Wordle about the kids which we hang up – the students get so surprised over the adjectives their parents use. Intro to Blogging – we start to talk about blogging on the second day of school because it is a huge part of our classroom. And then we start to discuss safety. Paper blog lesson – this is a great lesson shared by @McTeach and one that I love to do with my kids. Name sticks – I randomly pull sticks when we discuss and use them for group work. Pencil cups – I have tables this year so no more name tags on desks. Students will instead have a decorated pencil cup with their name on it. They work on this while I read aloud. Read Dear Future Mrs. Ripp Student letters aloud. Every year my students write a letter to the new kids sharing information about this classroom and how to get the best out of it. This year some of those students are still with me so I am going to share their letters with the whole class when they work on projects. Time Capsule – we measure height and write down our favorites and dislikes. The kids always crack up at the end of the year about what they wrote. Make Animoto classroom vision – the kids figure out our vision for the room and put in into Animoto. It really gets them thinking and helps them take ownership of the room, here is last year’s. Discuss classroom jobs – I have helpers every week and this year I added new jobs like Googler and Mapper. The Goggler will google questions we have submitted on a list and the mapper will keep track of where we connect with. Morning Routine – we discuss expectations; what type of morning do the kids want? How do we get started for the day? We come to an agreement on how it will run best. Random Pictures of Mrs. Ripp – I will be sharing a slideshow of random pictures from my life to see if the kids can guess what they mean to me. The following the kids will bring in their random pictures. Connect the students – this is a great activity that only requires paper and sharpies. The kids all write their name on the border of the paper and then one person makes a statement like “I play soccer.” Anyone else who plays soccer gets to connect their name to theirs and then the next person states something and so on. In the end you have a huge spiderweb of how connected we are in the classroom which I display even though it is super messy but it kind of looks like art. Rules discussion – I don’t set the rules, the kids do. So how do we want our room to function, how do we want it to sound, to look like? What will we do to maintain it. That conversation starts on the first day. Be a tour guide – I have some of my students from last year so why not have them give tours of the classroom. I have changed some stuff but not everything so then everyone can feel at home. Name your table. The students will come up with a table name and then create a banner for it. This will happen monthly as the students change tables. So there you go, just a couple of my to do’s for the first couple of days. If you see something you like; borrow the idea. Next postWhat Do You Have Room For? Oh how I love the idea of the Googler job! As always, such great ideas! This is why I love being connected with others. I love sharing ideas. Thank you Patti for the great book recommendation, I just ordered it from my library and cannot wait to share it with the kids! Excellent post. I'm curious about how the pencil cup name holder will work. I'm always looking for new ways to have my students' names visible for supply teachers regardless of the formations of the desks. This year I tried name tags with magnets so I could easily move the names to different spots on the desks. It worked some of the time but I had issues with students picking at them.Do you assign seating for the first day or allow them to sit where they want at first? These are great ideas! I especially like the "connect the students" one–I'll definitely be stealing that to use with my future students.